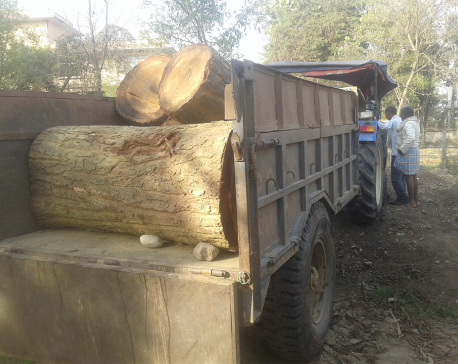 NEPALGUNJ, March 5: It became a real challenge for the consumers of Usha Greenery Community Forest (UGCF) to retrieve 49.44 cubic feet long Sal logs from smugglers who were preparing to load the timber in their tractor at around 10 pm on Friday. After a tussle of about half an hour, the consumers were able to take the tractor and its driver under control but not the smugglers. Though they had urged Area Police Office (APO), Kohalpur for providing security to them, they accused the police of not co-operating with them. The consumers claim that they would have been successful in nabbing all the smugglers if the police had co-operated with them. They also accused the police of plotting to free the driver of the tractor without any punishment. However, APO has declined the accusations. Inspector Nawaraj Pokhrel of the APO claimed that the consumers were able to catch the driver and tractor with the help of police. “We were the ones who caught the driver. The smugglers were successful in escaping after the consumers started making noise,” claimed Inspector Pokhrel. On March 1, forest guards had found the marks of tractor tires in the forest during a patrol. That was when the consumers and forest officials came to know that there was something wrong in the community forest. Smuggling has been rife in various community forests of Nepalgunj, Kohalpur and Ranjha. As the network of smugglers is spreading, it has been a great headache for the consumers. Tej Kumari Oli, secretariat member of the Community Forest Consumers Association laments that protecting the community forest has been a challenge.